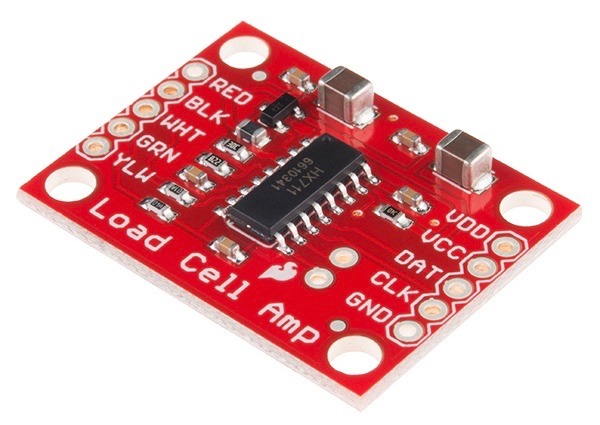 HX711 Load Cell Amplifier. Image by Sparkfun licensed and re-distributed under CC BY 2.0. Connect GND to GND, VCC to 3.3V and the other three MISO (or SO for short), CS and CLOCK (or SCK) to free GPIO pins. name (Required, string): The name for the load cell sensor. dout_pin (Required, Pin Schema): The DOUT (or DAT) pin. clk_pin (Required, Pin Schema): The CLK pin. Wait for the data to arrive in the logs and write down the value. For example 120. Again wait for the data to arrive and note the value, for example 810. Replace the masses and values 120.0, 810.0, etc with your values.